Art Singleton joined the Hashem Law Firm in 2016. He is a native of Monticello, Arkansas. Art graduated from Arkansas State University with a degree in Agricultural Business before attending law school at the William H. Bowen School of Law in Little Rock, where he earned is Juris Doctor degree with honors. As a student at Arkansas State, Art worked multiple internships for leading Arkansas agribusiness organizations including the Arkansas Farm Bureau Federation and Riceland Foods. Art also interned for the USDA Natural Resources Conservation Service (NRCS), where he studied federal conservation programs such as the Environmental Quality Incentives Program (EQIP). During his last semester at Arkansas State, Art worked in Washington, D.C., serving as the Staplcoton Congressional Intern in Congressman Rick Crawford’s office where he analyzed farm legislation associated with the 2014 farm bill and its impact on Arkansas farmers and businesses. 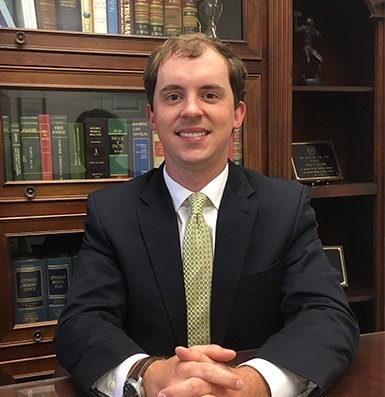 While in law school, Art served as a government relations intern for Riceland Foods, representing its farmer-members on both a state and national level. During law school, Art received Top Paper Awards in multiple classes including Closely Held Business Organizations and Real Estate Transaction Skills. He was also a member of the Delta Theta Phi Law Fraternity during law school. Today, Art works as an associate attorney for the Hashem Law Firm. His practice covers an array of legal areas requiring both counseled legal advice as well as zealous representation in the courtroom. When he’s not working, Art enjoys duck hunting, golfing, and spending time with his wife, Savanna. We invite you to give us the opportunity to address your case and the possible solutions even if you do not end up retaining us. We do not ask you to choose us. We ask you to choose the right lawyer.